In June 2004 the webmaster identified a need for a high resolution digital camera to partly replace the film-based 35mm cameras he uses for technical photography. The new camera needed to have as much of the same functionality as a 35mm SLR as possible, but cost under $1,500. The Nikon D70 was ultimately chosen. This page presents information on the camera's capabilities and limitations. Unless otherwise noted, all tests were performed using an unmodified D70. Astrophotography is a very demanding test of any camera - whether film-based or digital. 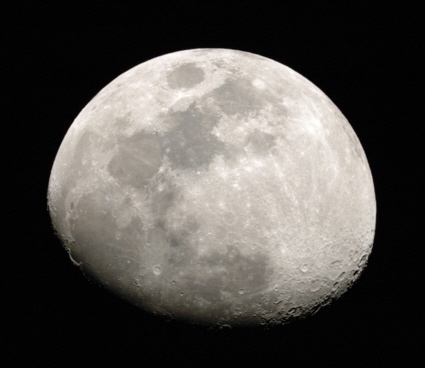 Thus far the webmaster has had limited opportunity to test the D70's astrophotography capabilities. This experimental whole disk image of the Moon reveals a wealth of terrain and tonal detail. The webmaster coupled his D70 to an 8-inch Schmitt-Cassegrain telescope and field flattener/corrector. The exposure was 1/1000 second at f/6.3 and ISO 1600. The image was captured in NEF format, converted to TIFF, and processed in Picture Window Pro 3.5. Frame 2005-004. Copyright 2005, Brian Webb. Known for its red hue, Betelgeuse (top) is one of the winter sky's brightest stars. The webmaster placed a diffraction grating in front of his digital camera to spread the star's light into a spectrum (bottom). The spectrum's dark bands were caused by the absorption of specific colors by molecules in Betelgeuse's atmosphere. Frames 2005-009 and 2005-010. Copyright 2005, Brian Webb. Although the Nikon D70 was not designed for infrared photography, it can record high quality IR images when used with the proper filters. Most important is a filter that blocks visible light, but passes infrared. Many IR filters leak light at the ultraviolet end of the spectrum. A UV blocking filter can improve images by blocking unwanted ultraviolet radiation. Finally, a polarizing filter can improve contrast, cut haze, and darken the sky. 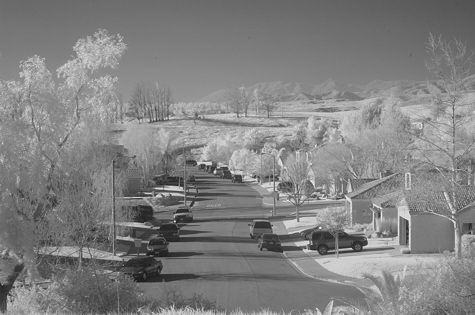 This infrared image taken on a hazy afternoon reveals distant mountains totally invisible to the naked eye. Vegetation appears bright because chlorophyll is highly reflective in the IR. The exposure was 13 seconds at f/16 and ISO 400. The image was taken through a RM90 (infrared), UV/haze, and linear polarizing filter. The color photo was converted to black and white and sharpened. Frame 2005-007. Copyright 2005, Brian Webb. The D70 can also take usable images in the ultraviolet portion of the spectrum. This requires using a filter to pass UV radiation and an infrared blocking filter to prevent image degradation from IR leakage. This ultraviolet image of a common flower reveals features unseen in visible light. 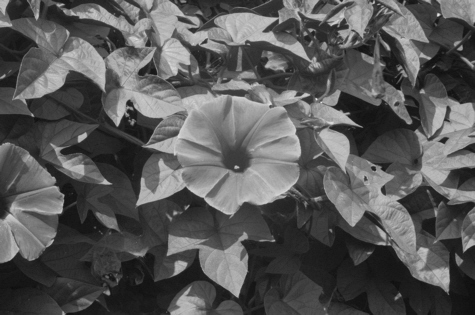 To the eye, the center of the flower is bright and the petals are essentially featureless. The exposure was 15 seconds at f/16 and ISO 400 through 403 ultraviolet pass and BG38 IR blocking filters. The color photo was converted to black and white and sharpened. Copyright 2005, Brian Webb. A key factor that limits the length of time exposures that can be taken with this camera is electronic noise. To determine the longest practical exposure time, the webmaster turned on his Nikon D70 allowed it to warm up for 60 minutes. A series of test exposures were then made in manual mode without noise reduction at ISO 200 and 1600. The ambient room temperature was 74° F (23.5° C). The images were examined to identify the point at which noise was barely noticeable at the two ISO settings. The longest time exposures that can be made before noise appears at ISO 200 is 4m45s. At ISO 1600 the maximum exposure was 40s. 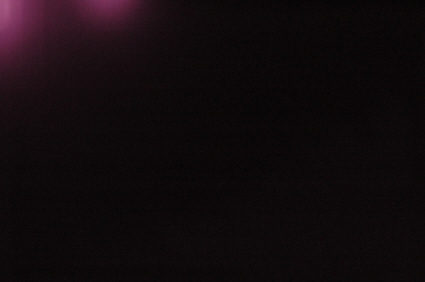 Nikon D70 time exposure photo showing the onset of internal electronic noise (magenta area). Noise first appears in the upper left followed by less intense noise from the lower right. Frame 2005-011. Copyright 2005, Brian Webb. An important consideration to take into account when making long time exposures is the camera's battery capacity. As an experiment, the webmaster charged the Nikon D70 battery pack and the camera was used promptly to take several 15m00s time exposures. The 15m00s exposure time was chosen because it approximates the maximum exposure needed for wide field astophotography from a dark site. At 68° F (20° C) the Nikon D70 battery pack allowed for eight 15m00s time exposures. A ninth 15m00s exposure was made, but the at the end of the exposure the battery low warning was flashing. The battery appears to lose strength rapidly after charging. The webmaster has the impression that if a few days have passed since the battery was fully charged, it only allows for a total of roughly 30 minutes of time exposures. The Nikon D70 records the time and date of each exposure. The internal clock in the webmaster's camera has proven to be rather accurate, running only 15.5 seconds fast over a 32-day period. In other words, the clock outpaces the actual time at the rate of 0.484375 seconds per day. Copyright © 2005-2016, Brian Webb. All rights reserved.